Morton Elementary School First Graders visiting the Bear Mural at Central Plaza by Mat Taylor and Mike Strescino. Program: The Shoe Factory K-12 Arts Education Program. Photo by Anne Scott. What’s on the horizon for community solar in 2018? Clean Energy Collective offers an exclusive outlook on growth, innovation, and external pressures. From an evolving market structure to technology innovation, the community solar landscape is transforming quickly. What does this mean for 2018? Clean Energy Collective (CEC), the nation’s leading community solar developer and solutions provider, offers its forecast for what’s on the horizon for community solar. 1. Strategic partnerships will accelerate the drive to scale. 2017 saw solar financiers and asset owners looking to become more involved in the earlier stages of community solar development, seeking the potential of stronger profits indicative of this asset class; evidenced by CEC’s joint development agreement with ENGIE and REC Solar’s purchase by Duke Energy. Leveraging shared financial and technological resources will accelerate the development and deployment of more and larger community solar portfolios in 2018, broadening access to shared renewables to a significantly wider customer base. 5. Data security will be a key value proposition. As the shift to mobile and cloud technologies becomes the norm in most industries, data vulnerability is top-of-mind for all IT administrators. Data security processes and planning for community solar programming, particularly regarding the requisite administering software of bill credits and customer benefits, is vital for the protection of utilities, consumers, and the grid. 2018 will see an increased focus on available and emerging technologies delivering information security to meet the industry’s rigorous requirements. Security certification of community solar software solutions will quickly become the norm, raising the bar in solution maturity similar to financial technology solution. 6. Project finance and product strategies will move closer to balance. Expanding project financing options and sources is still at odds with the move toward more consumer-centric products. Both purchase and subscription programs have been subject to relatively strict terms from finance partners, limiting flexibility in product strategy. We believe 2018 will be turning point toward more adaptable financing as additional risk mitigations emerge and the finance market better understands the reduced risks inherent in community solar solutions. New technologies for acquiring and engaging customers, increasing participation by investment-grade companies, and further validation of community solar’s low customer default with the streamlined ability to re-subscribe replacement customers will allow for shorter contract terms, reduced credit score thresholds, and an overall enhanced customer buying experience. 8. Utilities will launch larger programs more frequently. Many utilities blazed the community solar trail in 2016 and 2017 to integrate DER solutions and satisfy customers. Several of the U.S.’ largest utilities now have operational community solar programs, and dozens more have initiated programs — in regulated and deregulated markets, by investor-owned, cooperative, and municipal utilities. Such pervasive exposure has provided sufficient evidence for the best practices that allow for low-risk, cost-appropriate, and highly engaged community solar programs. In 2018, we expect to see less “piloting” by first-time utilities and more comprehensive, full-scale deployments by those currently testing programs. This move to scale will provide further economic efficiencies, driving even more benefit to utilities and customers. 9. Prevailing policy will accelerate market development. Advanced tools and resources are emerging to help policymakers, regulators, and advocates navigate tariff and compensation strategies, incentives, land use and siting criteria, interconnection issues, consumer protections, and more to balance a market’s diverse interests and a program’s economic viability. In 2018, state policy development will take on a renewed urgency, and we expect to see community solar raised as a key platform item by many candidates in the state and federal elections coming in November 2018. Streamlining adoption of well-vetted enabling policies and regulatory frameworks in slower-to-adopt states will translate into faster legislative action, fewer pilot programs, and more receptive markets. Clean Energy Collective (CEC) is the nation’s leading developer of community solar solutions. CEC pioneered the model of delivering clean power-generation through medium-scale solar PV facilities accessible to all utility customers. Since establishing the country’s first community-owned solar array near El Jebel, Colorado in 2010, CEC has built or has under development more than 130 RooflessSolar projects within 33 utility service territories across 15 states, serving thousands of customers, and representing more than 310 MW of community solar capacity. CEC is also the leading provider of community solar software and services to the utility, development and financial industries through its Community Solar Platform. Visit www.cleanenergyco.com for more information. INSUL-DECK Roofs are structurally superior to traditional wood-truss roofs because of much higher strength of reinforced concrete. They can be designed and built to withstand extremely high winds and the impact of most flying debris in hurricanes and tornadoes. An INSUL-DECK Roof combined with concrete walls basically resembles a bunker – made cozy with great insulation. The reinforced concrete also provides high Fire Resistance Ratings (using ACI 216.1) and very long lifespans. Research has shown that a large portion of the energy loss in a typical building is literally “through the roof”, leading to unnecessarily high heating and cooling bills. With INSUL-DECK roofs, the insulation is built-in, continuous, and not subject to uneven installation, and air-infiltration approaches zero, resulting in a significant reduction in energy loss and utility bills. The combination of airtightness, insulation, thermal mass, and strength of INSUL-DECK roofs provide amazing thermal comfort and the feeling of the strength of a cozy castle. The excellent sound deadening properties of concrete roofs can help to quiet your indoor environment by greatly reducing airborne noise transmission. To learn more about Insul-Deck please refer to the following specification sheet. Feel free to contact us today to see how Insul-Deck can serve as your first choice for floors and roofs. Where do we turn for thoughtful leadership in 100% renewable energy? Yesterday we formally announced our support of Posada and Pueblo's Energy First's Environmental Justice Collaborative Problem-Solving (EJCPS) Cooperative Agreement Grant Application. All communities are now facing the reality that the course of direction moving forward must include local ownership in the conversation. Each locality has its own unique culture and landscape and methods and processes will have to be studied to ensure the well-being of citizens today and tomorrow. To help navigate this thought leadership landscape where one wonders who's got the facts, we have started a new YouTube video playlist called 'Achieving 100% Renewable Energy' to showcase the many faces and voices of energy today. We launch this series with Sustainability Symposium 2018 keynote address by Governor Martin O’Malley who describes how the U.S. can get to 100% renewable by 2050, as well as our moral imperative for doing so. Subscribe to this playlist so you can be up to speed on what advocates are sharing around the world. To learn more contact Pueblo Sustainable Solutons L3C today. Pueblo Sustainable Solutions L3C is pleased to offer its support for the Posada Environmental Justice Collaborative Problem-Solving (EJCPS) Cooperative Agreement grant application to develop and implement solutions with Pueblo’s Energy Future as a partner. We understand this agreement seeks to address environmental and/or public health issues for low-income populations in the Pueblo, Colorado Community. As a mission driven low-profit private enterprise, one of our key priorities at Pueblo Sustainable Solutions L3C is to foster the continued development and ongoing research of sustainable solutions for effective and meaningful waste management in Pueblo, Colorado. Achieving sustainable waste management aligns with our core initiatives. Preserving affordable housing, achieving 100% renewable energy and ensuring thoughtful industrial hemp production in our local community round out the balance of our complimentary focus. Pueblo Sustainable Solutions L3C will provide ongoing needs-based services in conjunction with the proposal submitted by Posada to the EPA Environmental Justice Collaborative Problem-Solving Cooperative Agreement. Programming Support and Access to Our Advisory Members focused on how reducing, reusing, and recycling can help the local community and the environment by saving money, energy, and natural resources. Recycling Educational Campaign showcasing the successful outcomes of waste management and diversion practices at the state and local levels, especially amplifying the narrative of local efforts in our community. We will work collaboratively with Posada and Pueblo’s Energy Future to ensure our goals are aligned with the goals of the grant proposal, including efforts to track and report on outcomes. We believe our support and commitment will significantly improve environmental justice in the city of Pueblo, address the needs of low-income populations throughout the duration of the EPA grant which should take place 2018 through 2020. We look forward to working with Anne Stattelman at Posada and Rebecca Vigil of Pueblo's Energy Future on this exciting endeavor. Welcome to the Evolution of Sustainability | What's in your neighborhood? Talking with many people in the solar industry the last few days, well, the entire renewable industry regarding what seems to be a giant attack, and a huge step in the wrong direction from Washington. From the announcement of cuts of 72% to the renewable energy budget, the praising of coal like it's the 50's, the opening up of nationally protected lands, the removal of important regulations to protect our water and land, and now the a tariff of 30% on solar products. You don't have to be a genius to see what is going on here. Additionally, Washington can't fix this, they can't fix anything! I will say this, "the fix is in" in Washington. Well, I'm here to tell you the states, the cities, the towns all across America are going to renewable energy. Pueblo, Colorado is just one example. They have chosen not to renew the contract with Black Hills Energy, and have decided to go 100% renewables. We are working with the city of Pueblo to help assist with the design and development of genuine, stand alone developments. To give a little more info, we are going to build 1MW solar farm, manage our own water, and compost our waste so it doesn't end up in a landfill, all in conjunction with the city. Now imagine the most advanced sustainable homes, a large community center with pool, gym, theater, restaurant, and offices, a working farm for food production. It will have walking trails, bike trails, a skate park, and the new hyper loop train just around the corner where you can go from Pueblo to Denver in 15 minutes. Cool right!? But it's not enough. So we imagined that every homeowner will have a vested interest in the solar farm, water management, and waste programs. Working directly with a city that helps us through the purchase of excess energy from our solar field, to water and waste management. Self reliant, self sufficient, sustainable, and now profitable for the communities and the cities and towns. We now have the power, we have the technology, we can make your community better, faster, stronger, and financially independent, and will be cleaner and healthier We can get rid of Mr. "Bill". Say goodbye to big controlling interest and give the power back to the individuals, the homeowners, the communities, the people of America. From my vantage point I see change coming fast. Yes, Washington, Big Oil, Big Banks, Big Ag, Big Pharma, Big Tech will do everything in their means to buy politicians in Washington, which is handed down as bad policy for all Americans and great for them. Remember, they write most of the legislature in Washington, if you didn't already know. But the army of hard working people in towns all over America, hell, all over the world care about the future of it's children and their children and their children. The profits of a handful of corporations and their stockholders will not outweigh the soul of America, ever! Welcome to the Evolution! Welcome to Freedom! For more information go to pueblosustainablesolutions.com. What are the most important considerations for building a sustainable community here in Pueblo, Colorado? We have created a summary of the core ideas and values which help inform and guide us as we design and build into the future. To learn more about creating a socially sustainable future, visit our new page at Pueblo Sustainable Solutions L3C. You can also follow us on social media, subscribe to this blog, and contact us directly. Today we released a preview of the Casa Verde Model which will be one of several housing designs to become part of a new sustainable community which is in pre-development in Pueblo, Colorado. Our goal is to fold into the conversation the concept of sustainability and what it means for homeownership and the community. We are excited to incorporate our Sustainable Design Intelligence into each and every design. To learn more visit the housing section of our website or contact Jeff Howell, Director of Development. 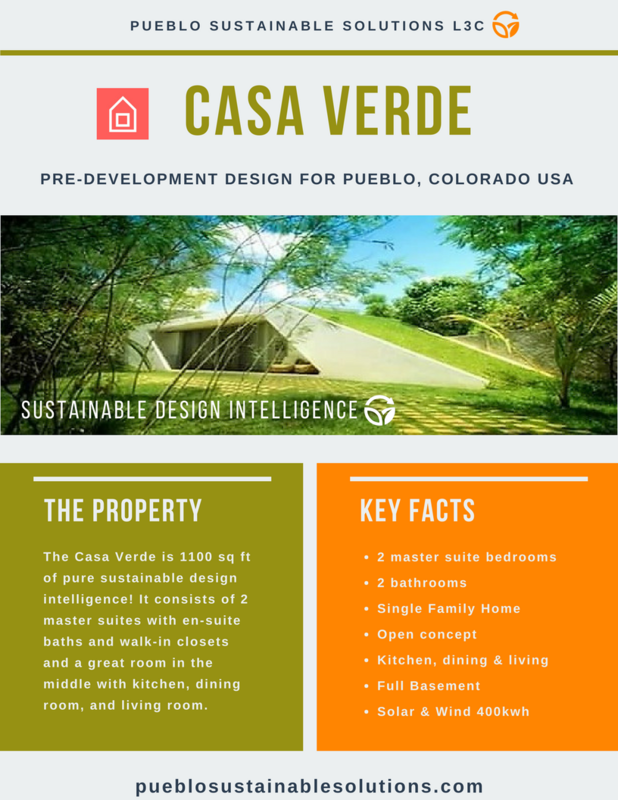 The Casa Verde is 1,100 sq ft of pure sustainable design intelligence! It consists of 2 master suites with master baths and walk-in closets and boasts a great room in the center with a kitchen, dining room, and living room. The core and shell of the building utilizes Nudura Insulated Concrete Forms (ICF) along with Insuldeck, an insulated concrete form for ceilings and roofs. The walls are all 6” ICF’s with a green roofing system for an R rating of over 50. The basement consists of a large cistern along with a green catchment system for water management in the basement. The dwelling is powered with a combination of solar and wind for a total output of over 400 kwh. The home has a composting septic system built in for waste management. The design can also incorporate geothermal cooling/heating system. The interior and exterior finishes can be built to order from flooring, cabinetry, trimwork, appliances, electrical and plumbing. Today we introduce new iconography for our core business platforms of affordable housing, energy, waste and industrial hemp. You will start to find these images dotting our landscape as we tell the stories of sustainability along the Arkansas River in Pueblo, Colorado and beyond. The mission of Pueblo Sustainable Solutions L3C is to communicate the most interesting and relevant critical thinking in renewable and sustainable energy in order to bring together the research community, the private sector and policy and decision makers. The mission of Pueblo Sustainable Solutions L3C is to communicate the most interesting and relevant critical thinking in renewable and sustainable energy in order to bring together the research community, the private sector and policy and decision makers. The aim of our team is to share problems, solutions, novel ideas and technologies to support the transition to a low carbon future and achieve our global emissions targets as established by the United Nations Framework Convention on Climate Change. Climate change and energy security are two of the most significant challenges the world faces today and future generations will inherit tomorrow. Pueblo Sustainable Solutions L3C is mission driven to make a choice for positive change. At Pueblo Sustainable Solutions L3C, we are committed to protect you and our planet. Through our many initiatives you can make the carbon-conscious choice to work together to move our society one step closer to a more sustainable world. Join in, get wet and help make a difference! Pueblo is and always has been a city at the crossroads where people and ideas converge in a powerful display of creative genius. Since its earliest days, the citizens of Pueblo have brought to the fabric of the community a long tradition of exploration, discovery and self-expression --- turning ideas into action. The Arkansas River in Pueblo has served as the international boundary with France, Spain, Mexico, and the Republic of Texas, making it a true frontier region in the southwest where everyday is extraordinary.The region has been at the epicenter of opportunity in Colorado since the early 1840s when the early settlers built the El Pueblo Fort for trading and commerce. The steel industry driven by Colorado Fuel & Iron ushered in generations of workers from around the world who brought with them their own unique cultures and perspectives on humanity. Exploration, discovery and self-expression have been key drivers in the development of Pueblo since its earliest beginnings. History, culture and the arts have empowered individuals to share their stories of the good, the bad and the ugly. Humanity can get messy, but it is during these moments when one finds him or herself on the fringe or outside of one's comfort zone that light shines bright. A community that embraces and understands the power of light and creativity is more apt to be fluid and flexible in the process of problem solving. Change agents in the community welcome diversity and encourage participation and ownership from all stakeholders in the conversation. NO is a hard YES and you have to hold down the grass really hard when you create a new pathway for others to follow. Change is hard. And when you add sustainability to the equation, 1 + 1 does not always equal 3. It takes failure and a lot of courage to make a difference for our children of the future. Pueblo's unique landscape is fostering the extension of the frontiers of opportunity. Communities must have a conversation about the complex issues of shelter, energy, waste, water and food when we talk about sustainability and the human race. This must start locally. Pueblo has the courage and the capacity to face the challenges before us today. We are excited to share our first issue of SUSTAIN which is our bi-annual publication sharing stories of sustainability along the Arkansas River. The format honors the very colorful and rugged 'zines' that are often found distributed in local creative economies. The content is highly targeted and aims to get to the point of the message. 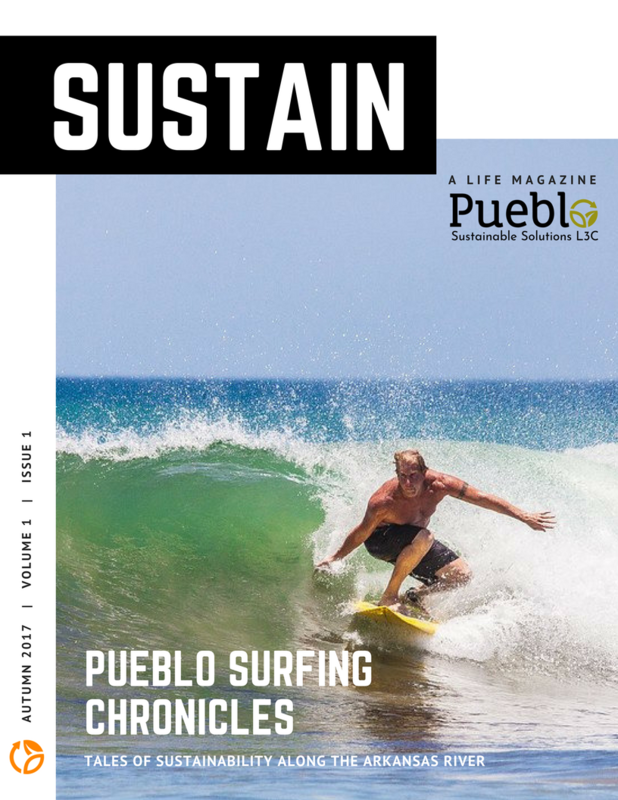 The cover features Pueblo Sustainable Solutions L3C co-founder Jeff Howell riding a beautiful wave. Since childhood Jeff has found the ocean surf to be his church or sanctuary. It is here that he confronts the opportunity to share a moment with a wave which has the potential to carry him to shore. Pueblo too has its own unique surfing spot in the heart of Downtown along the kayak course located behind Union Station. As a mission driven low-profit private enterprise, you will find in each issue of SUSTAIN stories about our core issues of Housing, Energy, Waste and Industrial Hemp. This inaugural edition opens with Team Notes and an introduction on Pueblo Today & Sustainability. This is followed with L3C What? which is an explanation of the new L3C business structure which is a social enterprise bridging the private and public benefit spheres of accountability in action. This first section is rounded out with a brief story Two Brothers for Change which tells the tale of how two brothers managed to find their way to Pueblo. Get Wet on 5 is where we cover the latest trends and information on housing, energy, waste and industrial hemp. Lastly we have dedicated the last page to a section called Off the Grid which highlights an innovative person, business or organization who is questioning and challenging our understanding of culture and the world around us as we know it today. This issue features the powerful work of artist Raul Sosa and his exhibition 'a retrospective...so far'. Take a moment to get to know Pueblo Sustainable Solutions L3C and Get Wet! We hope you find something that you are passionate about and will consider becoming a part of our community movement. 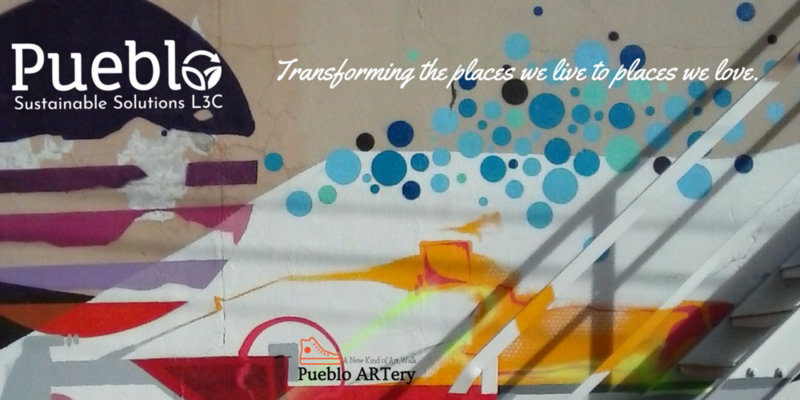 You will also notice that we feature local artists and creatives via their murals and artwork which adorn Pueblo in all directions. If you have not subscribed to SUSTAIN, please complete the subscription box below. WE PUT COMMUNITY FIRST, SEEK GROWTH, ARE OPEN TO CHANGE, DO GREAT WORK TOGETHER AND VALUE DIFFERENCES. Zine" is short for fanzine. Traditionally a zine is a cheaply-made, cheaply-priced publication, often in black and white, which is mass-produced via photocopier and bound with staples. Most zines revolve around a music scene of some sort, but others are dedicated to artwork, poetry, cartoons, editorials and short stories. Because zines do not have any sort of corporate backing, they are very rugged, individualized, and much more charismatic than larger, more popular magazines whose content is often dictated by their advertisers. Subscribe to SUSTAIN and Get Wet! Thank you for your interest in SUSTAIN! Our target areas of focus are Housing, Energy, Waste and Industrial Hemp. Want to learn more? You’re probably already interested in social engagement, innovation, and knowledge creation. That’s why you are here, right? Sign up to receive out magazine SUSTAIN and news releases. Sign up with your email address to receive news and updates twice a year. Thank you for signing up for our corporate zine SUSTAIN which is published twice annually in the spring and the fall.